There is not a lot of choice in the 3D physics engines and I ended up using WOW in combination with Away3D as Actionscript 3 3D engine. I started with the tutorial from Fabrice Closier port it to Flex and just play around with the options of WOW. One minus point of the WOW physics engine is that they are in a really early stage. You can only use Spheres and it isn’t rotating if they collide. I was pretty fast bored with the Spheres and I started to hack some extra shapes in. First a plane (what looks terrible if it isn’t rotating) and then a cube. 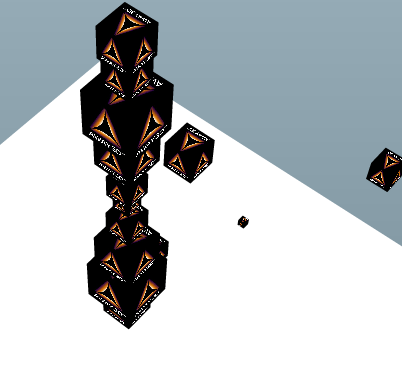 In the collision detection I added the cube and now he can collide with the spheres and other cubes. I’ve been digging for quite long to create some cubes with papervision3d that collide. If you run the demo and click with the right mousebutton in the grey area you can choose for “View source”. Thanks it was broken today.